Wild Mustard (Sinapis arvensis) is a dicot weed in the Brassicaceae family. In Manitoba this weed first evolved resistance to Group O/4 herbicides in 1990 and infests Cropland, Spring Barley, and Wheat. Group O/4 herbicides are known as Synthetic Auxins (Synthetic auxins (action like indoleacetic acid)). Research has shown that these particular biotypes are resistant to 2,4-D, dicamba, dichlorprop, MCPA, mecoprop, and picloram and they may be cross-resistant to other Group O/4 herbicides. Debreuil, D. J., L. F. Friesen, and I. N. Morrison. 1996. Growth and seed return of auxin-type herbicide resistant wild mustard (Brassica kaber) in wheat. Weed Sci. 44:871-878. Also: Jasieniuk, M., I. N. Morrison, and A. L. Brǔlé-Babel. 1995. Inheritance of dicamba resistance in wild mustard (Brassica kaber). Weed Sci. 43:192-195. Also: Heap, I. M. and I. N. Morrison. 1992. Resistance to auxin-type herbicides in wild mustard (Sinapis arvensis L.) populations in western Canada. Weed Sci. Soc. Am. Abstr. 32:55. Also: Deshpande, S. and J. C. Hall. 2000. Auxinic herbicide resistance may be modulated at the auxin-binding site in wild mustard (Sinapis arvensis L.): a light scattering study. Pestic. Biochem. Physiol. 66:41-48. Also: Hall, J. C. and H. Zheng. 2000. Genetic insights into the mechanism of action of the auxinic herbicides. Weed Sci. Soc. Am. Abstr. 40:143-144. Reduced binding to auxin-binding protein(s) is the probable basis for resistance. Field, Greenhouse, and Laboratory trials comparing a known susceptible Wild Mustard biotype with this Wild Mustard biotype have been used to confirm resistance. For further information on the tests conducted please contact the local weed scientists that provided this information. There is no record of differences in fitness or competitiveness of these resistant biotypes when compared to that of normal susceptible biotypes. If you have any information pertaining to the fitness of Group O/4 resistant Wild Mustard from Manitoba please update the database. The Herbicide Resistance Action Committee, The Weed Science Society of America, and weed scientists in Manitoba have been instrumental in providing you this information. Particular thanks is given to Lyle Friesen for providing detailed information. Bahmani, A., A. Naderi, E. Zand, M. Masumi, and S. Lack. 2015. Evaluation of selection intensity of acetolactate synthase-inhibitor herbicide resistance endowing Asp-376-Glu mutation in Sinapis arvensis biotype.. Biological Forum 7 : 901 - 905. In current study we estimated ecological measures of Acetolactate synthase herbicide resistance evolution at lower than recommended dose in Sinapis arvensis herbicide resistance (HR) homozygous for Asp- 376-Glu mutation and herbicide susceptible (HS) biotypes collected from wheat fields in Fars Province, Iran. At low herbicide doses of mesosulfuron + iodosulfuron plants can survive and display quantitative variation in dose-responses. LD50 and GR50 values represented 5.4 and 3-fold ALS resistant than susceptible biotypes. Seed number production per plant showed 3- fold resistance. Linear combination of survival and fecundity values, showed 1 and 0.74 fitness values for (HR) and (HS) biotypes respectively when exposed to the lowdose of 187 g ha-1. With double increasing from 187 to 375 g ha-1 herbicides, fitness decreased by 8-fold in (HS) biotype but reduced slightly by 20% in (HR) biotype. The selection intensity of (HR) at 375 and 187 g ha-1 were 9 and 1.4 respectively. Overall, it is highlighted that evaluation of plant survival and fecundity in assessing mesosulfuron + iodosulfuron selection intensity in the (HR) and (HS) Sinapis arvensis biotypes is a key factor for measuring herbicide resistance evolution..
Warwick, S. I. ; Martin, S. L.. 2013. Gene flow from transgenic oilseed Brassica juncea (L.) Czern. into weedy Sinapis arvensis L. (wild mustard). Plant Breeding 132 : 688 - 693. Gene flow from acetolactate synthase-resistant (HR) Brassica juncea oilseed canola to related weed, Sinapis arvensis (density 1 plant/m2) was assessed in a 100 m2 field plot of HR B. juncea. Two HR F1 hybrids (H1 and H2) were detected among 109 951 seedlings screened with imazethapyr (hybridization frequency - 1.8×10-5). Hybridity was confirmed using flow cytometry, B. juncea-specific amplified fragment length polymorphisms (AFLPs) markers, genomic in situ hybridization (GISH) and PCR-based detection of B. juncea's HR gene. H1 and H2 had 2n=27 and 2n=45 chromosomes, corresponding 3x (SrAB) and 5x (SrAABB) genomic structures and reduced male fertility, 3.2 and 16.6% pollen viability, respectively. H1 was self-incompatible, whereas H2 set seed when selfed (B. juncea trait). Selfed F2, F3 and F4 plants showed HR trait persistence and vigorous growth and high (80-100%) pollen fertility in 22% and 39% of the F2 and F3 plants, respectively. No progeny were obtained from F1, F2 or F3 hybrids × S. arvensis backcrosses, suggesting the likelihood of introgression of traits is low to negligible..
Mithila, J. ; Hall, J. C.. 2012. Transfer of auxinic herbicide resistance from wild mustard (Sinapis arvensis) into radish (Raphanus sativus) through embryo rescue. Journal of Horticultural Sciences 7 : 29 - 33. The discovery of auxinic herbicides (e.g., 2,4-D, Dicamba, Picloram) for selective control of broad-leaf weeds in cereal crops revolutionized modern agriculture. These herbicides are inexpensive and do not generally have prolonged residual activity in soil. Although cultivated species of Brassicaceae (e.g., radish and other vegetables) are susceptible to auxinic herbicides, some biotypes of wild mustard (Sinapis arvensis, 2n=18) were found to be highly resistant to Picloram and Dicamba. 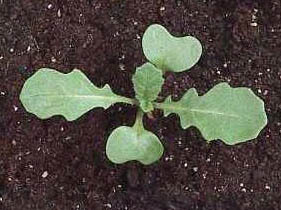 Inter-generic hybrids between wild mustard and radish (Raphanus sativus, 2n=18) were produced by traditional breeding coupled with in vitro embryo rescue/ovule culture. To increase frequency of embryo regeneration and hybrid plant production, several hundred reciprocal crosses were performed between these species. Upon altering cultural conditions and media composition, a high frequency of embryo regeneration and hybrid plant establishment was achieved. A protocol was also optimized for in vitro clonal multiplication of inter-generic hybrids produced by embryo rescue. To evaluate transfer of auxinic herbicide resistance from wild mustard into hybrid plants, several screening tests (involving in vitro, molecular-based as well as whole plant-based tests) were performed. Results indicated that hybrids of R. sativus × S. arevensis were resistant to auxinic herbicides suggesting, that, the resistance trait was transferred to these hybrids from the wild mustard. This research for the first time demonstrates the possibility of transfer of auxinic herbicide resistance from wild mustard to radish..
Mithila, J. ; McLean, M. D. ; Chen Shu ; Hall, J. C.. 2012. Development of near-isogenic lines and identification of markers linked to auxinic herbicide resistance in wild mustard (Sinapis arvensis L.). Pest Management Science 68 : 548 - 556. BACKGROUND: Auxinic herbicides are widely used for selective control of many broadleaf weeds, e.g. wild mustard. An auxinic-herbicide-resistant wild mustard biotype may offer an excellent model system to elucidate the mechanism of action of these herbicides. Classical genetic analyses demonstrate that the wild mustard auxinic herbicide resistance is determined by a single dominant gene. Availability of near-isogenic lines (NILs) of wild mustard with auxinic herbicide resistance (R) and herbicide susceptibility (S) will help to study the fitness penalty as well as the precise characterization of this gene. RESULTS: Eight generations of backcrosses were performed, and homozygous auxinic-herbicide-resistant and auxinic-herbicide-susceptible NILs were identified from BC8F3 families. S plants produced significantly more biomass and seed compared with R plants, suggesting that wild mustard auxinic herbicide resistance may result in fitness reduction. It was also found that the serrated margin of the first true leaf was closely linked to auxinic herbicide resistance. Using the introgressed progeny, molecular markers linked to auxinic herbicide resistance were identified, and a genetic map was constructed. CONCLUSION: The fitness penalty associated with the auxinic herbicide resistance gene may explain the relatively slow occurrence and spread of auxinic-herbicide-resistant weeds. The detection of the closely linked markers should hasten the identification and characterization of this gene..
Lezáun, J. A. ; Garnica, I. ; Eslava, V.. 2011. Study of a Sinapis arvensis population suspected to be resistant to tribenuron-methyl. : 145 - 148. A greenhouse trial has been carried out with different herbicides to prove its efficiency on Sinapis arvensis population suspected to be resistant to tribenuron-methyl. The results confirm that this population survives to all rates of tribenuron-methyl treatments tested. However, this population can be controlled with other family of herbicides, such as 2, 4-D 60% and bromoxinil 12%+ioxinil 12%+mcpp-p 36%..